Many of our clients ask about tooth whitening. In fact, it's one our most popular requests. And for good reason, everyone wants a bright white smile. When it comes to tooth whitening, there are several options and a few things to know as you consider those options. For instance, taking into account the reasons for a duller or yellow coloring of the teeth, such as eating habits, tobacco use, coffee, age and even medications or other factors. And we're here to help answer your questions and to guide you on your path to a brighter smile. For more information about tooth whitening, the American Dental Association has a very helpful and informative resource that you can visit by clicking here. It's a good place to start. Dental Bridges have been helpful dental therapy options for many years. Bridges can improve oral functions such as chewing and diminish speaking impediments brought on by missing teeth. Dental bridges come in several options, and the right solution can depend on a number of unique factors for each potential recipient. The basics usually include one or more false or artificial teeth situated between two or more anchored crowns. Modern dentistry includes installing implanted posts that are crowned, providing superior stability and durability. Naturally, the best option will depend on each patient's oral specifics. You can review a good source of basic information on Bridges and Partial Dentures by clicking here. One of the most exciting options in dental therapy is the development of dental implants. 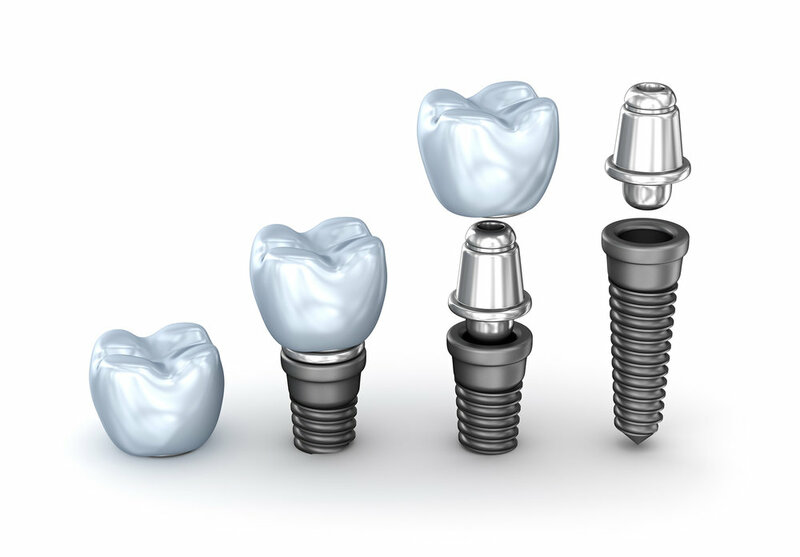 While implants have been around for many years, recent advancements in materials, technology and implant procedures have made dental implants a superior choice for many patients. Dental Implants provide several benefits to recipients, including a very durable (in many cases permanent) prosthetic with a beautifully natural appearance. Full oral functionality can be achieved in most cases. Materials used in implants are 100% bio-compatible. Perhaps surprisingly, the overwhelming majority of patients with implants report minimal discomfort and/or pain from the installation process. For many patients with missing or badly damaged teeth, implants can be a very viable and attractive option. Many of our patients have questions about Dental Implants, and we would love to explore with you if this might be a good option for your dental goals. In the meantime, here is a very good resource from the American Academy of Implant Dentistry that may answer some of your questions. When a tooth has severe enough damage from trauma, cracking or decay, it can be impossible to repair the structure and stability of the tooth sufficiently with simple fillings. In these cases, when the nerve of the tooth is sound, the solution is often a full-tooth crown that replaces the top portion of the tooth. The crown procedure is a fairly straightforward process of removing tooth material and preparing (shaping) the tooth to receive a form-fitting crown. In most cases, the crown adds significant stability and restores lost functionality, like chewing. Today's crown materials are very strong and virtually indistinguishable from the surrounding teeth. For more information on Crowns and how they are implemented, visit this excellent resource on WebMD. Veneers can be a beautiful solution for the dental goals of many of our patients. Veneers secure a thin layer of porcelain to the teeth in the "smile corridor" giving patients a bright and beautiful permanent smile in as little as one office visit. Veneers are durable, lifelike and very natural looking. Many actors and celebrities in the limelight rely on porcelain veneers for their "million-watt smiles." We would be very pleased to explore with you if Veneers might be right for you. The American Academy of Cosmetic Dentistry has a very good resource with information on Veneers that may answer some of your questions.